This year the Annual Parade will be held on Thursday, July 4th 2013 beginning at 10:30am. The route of the Parade begins at Stewart Avenue and North Dover Parkway; makes a left down Covert Avenue; a left down Salisbury Avenue; a right down Dover Parkway; a right down Tulip Avenue; a right down Covert Avenue and a final stop in front of the Stewart Manor Fire Department Headquarters on Covert Avenue. A barbecue follows in the municipal parking lot next to the firehouse. Please come up and grab some food, drinks, shirts, and win some raffles! There will be games, cotton candy, and music. Feel free to mingle with our firefighters and learn a little bit about what we do! SAFETY GUIDELINES: Please follow these guidelines so everyone has a safe and fun Fourth of July: 1. Act responsibly 2. Do not throw water balloons at police officers, military, or elderly 3. Water balloon throwing is permitted by all BUT everyone must act responsibly, with a demeanor appropriate for their age 4. 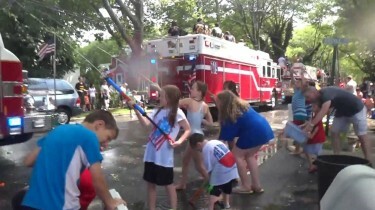 Children must stay on the sidewalks at all times when fire apparatus are in the street. By following these simple guidelines, the residents of Stewart Manor, visitors from other villagers, and the firefighters can have a fun, safe, and memorable Fourth of July! Thank you and we’ll see you on the Fourth!